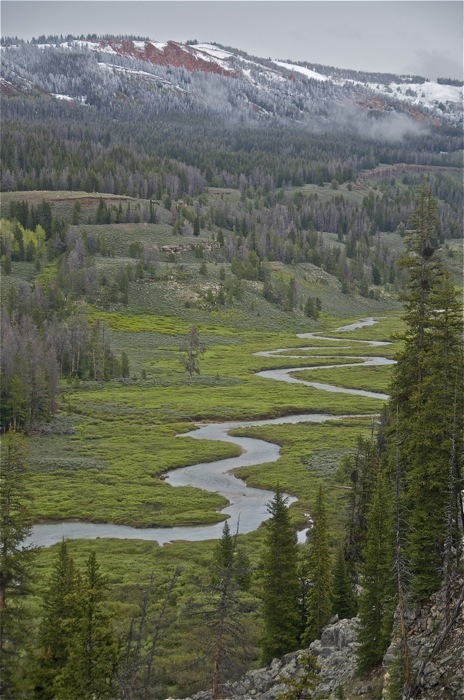 The Gros Ventre Wilderness (pronounced Grow-vahnt) lies directly across the valley of Jackson Hole from the rugged Grand Tetons and is within the Bridger-Teton National Forest. Here is an extremely beautiful Rocky Mountain wonderland of thick forest, lush meadows and long, gently sloping stream valleys rising to majestic snow-capped peaks. There are lakes and magnificent waterfalls. Here is one of the premier wildlife areas in the country and this is a great trip for viewing large mammals such as elk, moose, deer, bighorn sheep, bear and beaver. Many other wild critters thrive here, and there will also be late spring wildflower blooms. 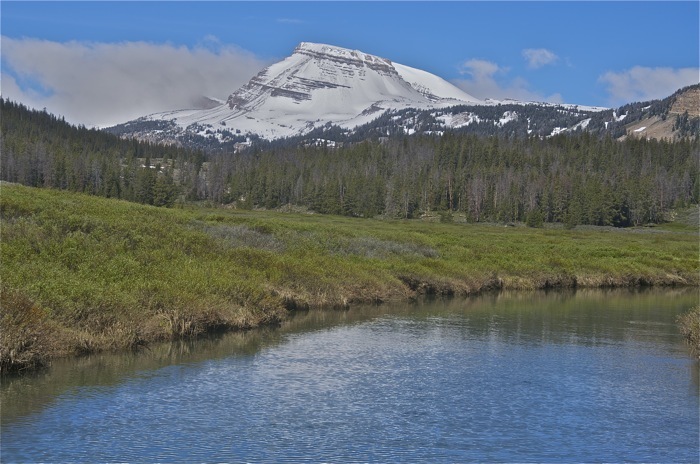 The Gros Ventre is a little known treasure, and offers one of the great wilderness experiences and some of the best hikes in Wyoming to be found anywhere in the Rockies! This is a moderate trip based out of Jackson, Wyoming. It may be an understatement to say that this is a great trip for viewing wildlife, as this area is literally teeming with critters in late spring! Our trail routes all explore the headwater mountains and drainages of the upper Gros Ventre River, and the upper Gros Ventre River Valley itself is one of the most beautiful mountain river valleys on the planet! TREK BASE: Antler Inn, 43 West Pearl, Jackson, WY; 800-522-2406 or 307-733-2535. Make reservations early; if the motel is full, they’ll place our clients at a nearby motel owned and run by the same people. MEETING TIME: Pre-trip orientation and safety talk plus food/gear handout at 6 PM the evening prior to the first day of the trip. So if the trip is from the 21st-26th, we meet at 6 PM on the 20th, in the Antler lobby. TRANSPORTATION: Fly to Jackson, cabs to motel available upon arrival. Make flight reservations early, because summer flights fill quickly! Alternatives: fly to Salt Lake, Idaho Falls, or Bozeman and rent car. For bus/van service from Salt Lake or Idaho Falls to Jackson, call Jackson Hole Express, 800-443-6133 or 307-733-1719. TREK RATING: This trip is moderate, with at least one layover, and backpacking mileages generally in the 6-8 mile range. For the most part, trail gradients are mellow, and most of the route is on trail. ELEVATIONS: 7,500 to 10,000 feet. 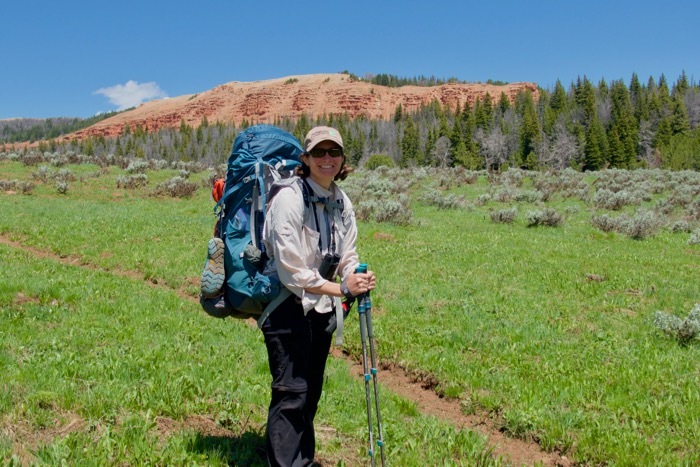 Maximum one-day elevation gain with packs is about 1200 feet. WEATHER: Late June can either be spring or summer, so be prepared for anything from snow to hot sun and 80 degrees. High country nights are chilly; afternoon thunderstorms are frequent, but usually fairly brief. Click here for a National Weather Service forecast. 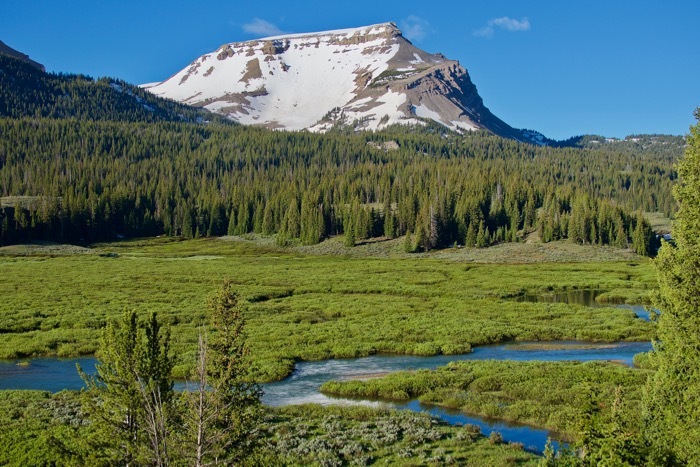 SPECIAL FEATURES: The Gros Ventre Range is astonishingly beautiful, with snow-capped alpine peaks rising above a mosaic of forest, flower-strewn meadow and verdant wetland. 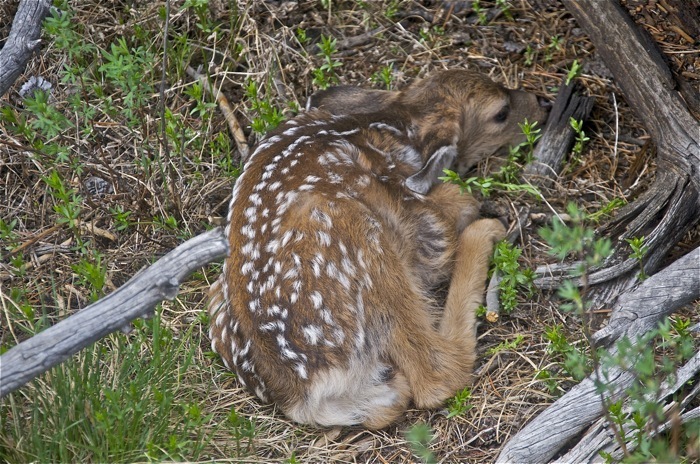 There are big populations of deer, elk, moose, bighorn sheep, bear, wolves, birds galore and much more! Though less well known than the nearby Tetons and Wind Rivers, the Gros Ventres are no less beautiful but they are much less visited by humans. 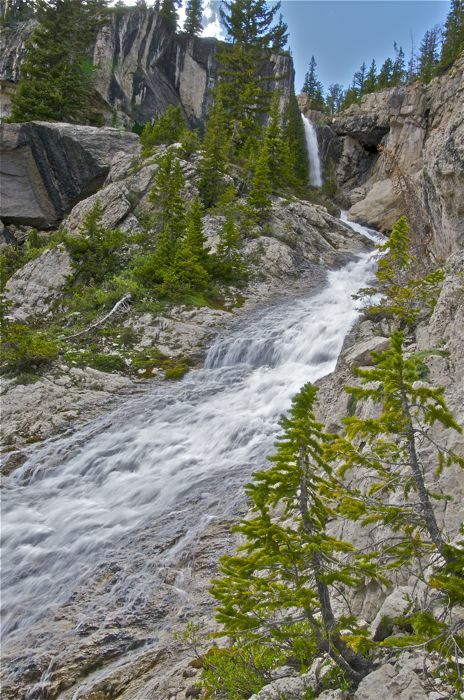 The upper Gros Ventre River Valley is breathtaking, as are a number of spectacular waterfalls! SPECIAL TIPS: Learn to pronounce the French name of these mountains: “Grow-Vahnt”. This is bear country, so leave all deodorants and other sweet smelling things behind. If possible, arrive in Jackson an extra day early to begin acclimating to the altitude, though we do not require this (there’s plenty to do/see around Jackson). STATUS: Big Wild co-owner Howie Wolke helped to get the Gros Ventres designated as a protected Wilderness area back in 1984, though some outlying parts of the range remain unprotected. ITINERARY: We generally do a loop, and the trailhead is about 1½ hours from Jackson, way up a dirt road. Return to the main backpacking in Wyoming page to view other related guided tours.